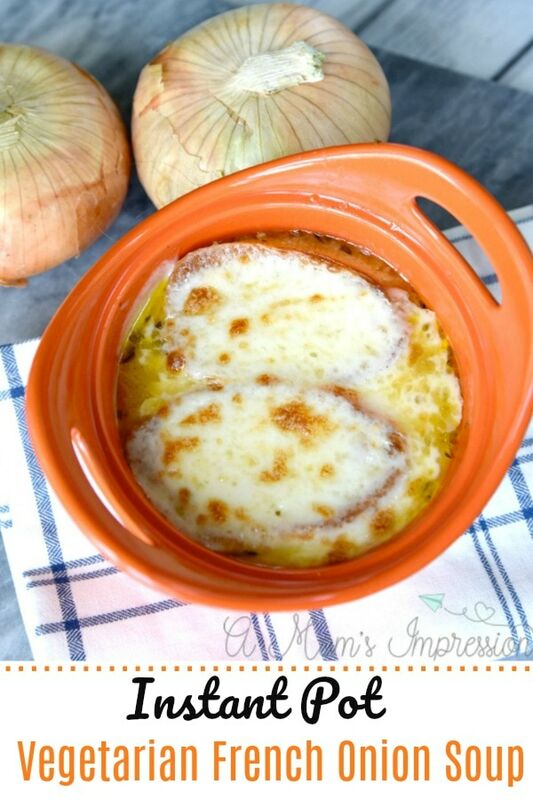 This Instant Pot Vegetarian French Onion Soup is full of flavor and easy to a make using your pressure cooker. The key ingredients are the seasonal Vidalia Onions! This post is sponsored by Vidalia Onions. My husband and I will be celebrating our thirteenth anniversary next month. It is hard to believe that we have been married for that long. When our anniversary rolls around each year I try to think of some special little things I can do to make him feel appreciated. This year I was thinking about one of his favorite dishes, French onion soup. I usually don’t make this at home because of the time it takes, but since I got my electric pressure cooker, I have been able to make things that used to take hours in a reasonable amount of time without sacrificing flavor. 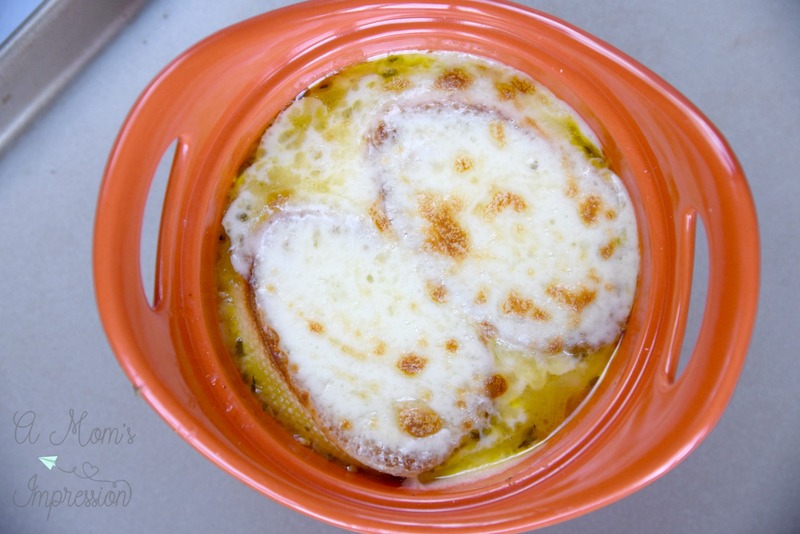 There is also another reason this time of year is the perfect time to make French onion soup. You guys, it is Vidalia onion season! Why is this so important? 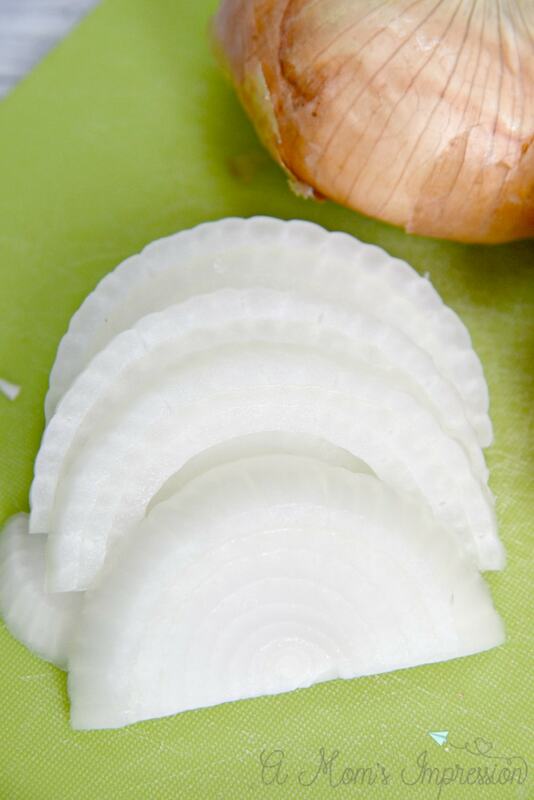 If you are a foodie like me you know that Vidalia onions are revered by some of the world’s best chefs for their sweet, distinctive flavor. 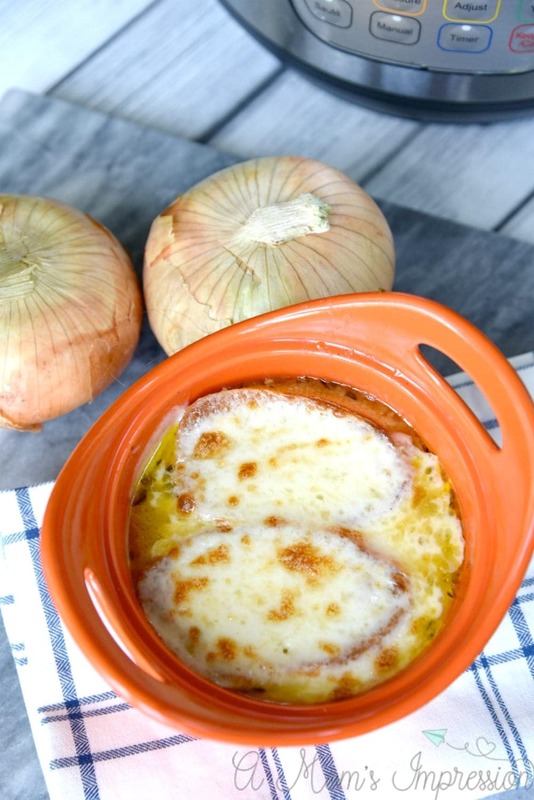 Vidalia onions are the secret to many amazing recipes including this vegetarian French onion soup! Vidalia onions are planted in the winter, by hand. Growers plant over 80,000 Vidalia onion seedling per acre. Vidalia onions are grown in 100 counties in South Georgia. They get their sweet flavor through the perfect combination of mild winters, low sulfur soil and a seed variety that has gone through rigorous testing. They are seasonal and you can only get them within a limited window sometime in April to sometime in August. 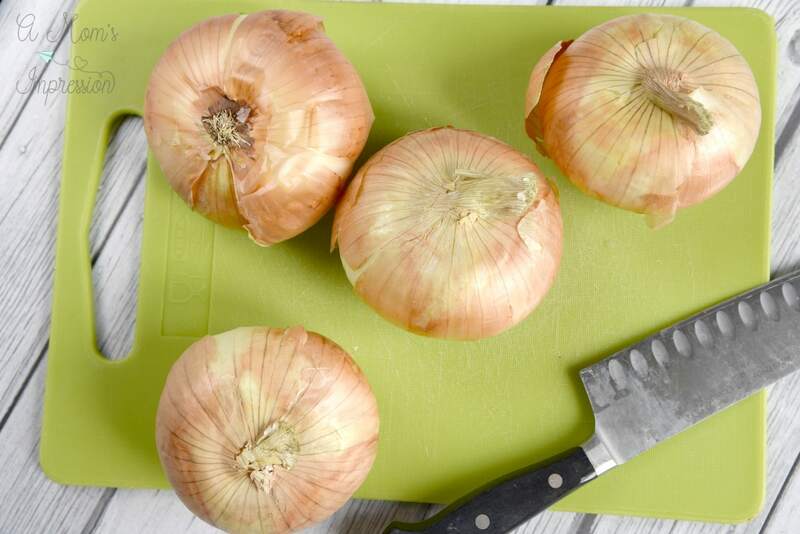 Vidalia Onions are incredibly versatile and add flavor to a wide variety of chef-inspired dishes from salads to side items, dressings, dips and even desserts. If you are going to make a vegetarian soup, you have to start with amazing vegetables. Vidalia onions give this soup a complex flavor that feels like it has been cooking all day. The secret is to caramelize your Vidalia onions using an electric pressure cooker and cut your time in half. It gives this recipe that complex flavor you normally get from stewing your soup for hours. Turn your electric pressure cooker to the sauté mode. Melt your butter and then add the onions, garlic, thyme, and bay leaf, stir to combine. Sauté the onions for about 5 minutes until they start to release water. Stir in 3 tablespoons water. Secure the lid to your pressure cooker, seal the valve and cook on HIGH pressure (manual setting) for 20 minutes. Once the timer has counted all the way down release the pressure to vent. Remove the lid, then turn your pressure cooker back to the sauté mode. 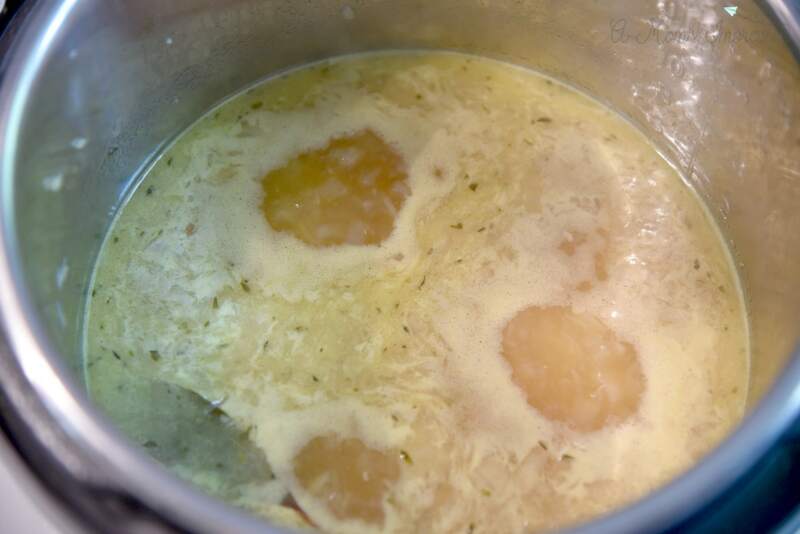 Cook your onions for about 5 – 8 more minutes until some of the extra liquid evaporates. Add the sherry and to bring to a simmer. Be sure to scrape up any brown bits on the bottom of the pot, it gives the soup a little more flavor. Let simmer for 10 minutes, until most of the sherry has evaporated. Discard the bay leaf. Add the vegetable broth and bring to a simmer. Cook for an additional 10 minutes or so until your soup has thickened. Finish with salt and pepper to taste. Preheat your broiler. Arrange ovenproof bowls on a sheet pan and ladle in your soup. 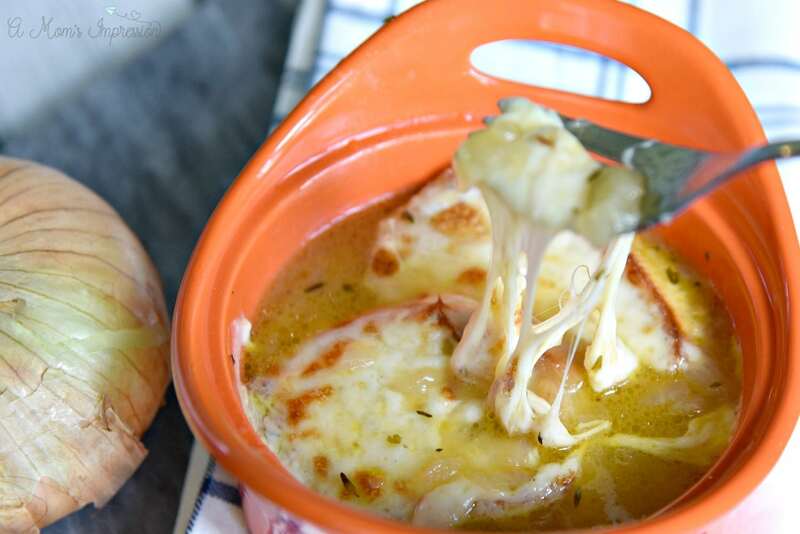 Float a slice or two of the baguette slices on top of the broth and cover with a slice of cheese. Broil until bubbly and golden brown, 3 to 5 minutes. Check out our fun demonstration video! 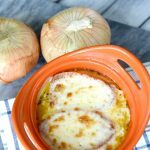 Easy Instant Pot Vegetarian French Onion Soup recipe made with seasonal Vidalia onions. Remove the lid, then turn your pressure cooker back to the sauté mode. Cook your onions for about 5 - 8 more minutes until some of the extra liquid evaporates. Add the sherry and to bring to a simmer. Be sure to scrape up any brown bits on the bottom of the pot, it gives the soup a little more flavor. Let simmer for 10 minutes, until most of the sherry has evaporated. Discard the bay leaf. To learn more about Vidalia Onions be sure to visit vidaliaonion.org.